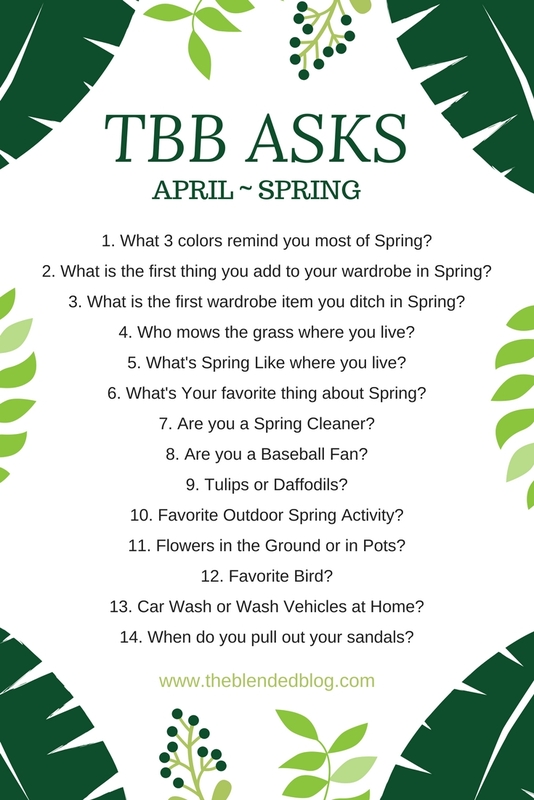 It's time for the monthly link up of TBB Asks. This month is all about Spring. Grab the graphic and go link up at TBB. 1. What 3 colors remind you most of Spring? Pink, purple and yellow. 2. What is the first thing you’d add to your wardrobe in Spring? A cute pair of sandal. 3. What is the first wardrobe item you ditch in Spring? Big bulky sweaters. 4. Who mows the grass where you live? My husband. I try to, but I don't mow it in the pattern that he likes. 5. What’s Spring Like where you live? It is a mix of sunny days and snowy days. I am all for the 60 degree plus weather because then we get the beautiful Spring blossoms. 6. What’s Your favorite thing about Spring? The Spring blossoms. I love how beautiful and colorful everything looks. 7. Are you a Spring Cleaner? I try to be. We have been Spring cleaning already. I used to set aside a full day to Spring clean, but now with toddlers, I just do it when I can. 8. Are you a Baseball Fan? Of course. Giants baby. 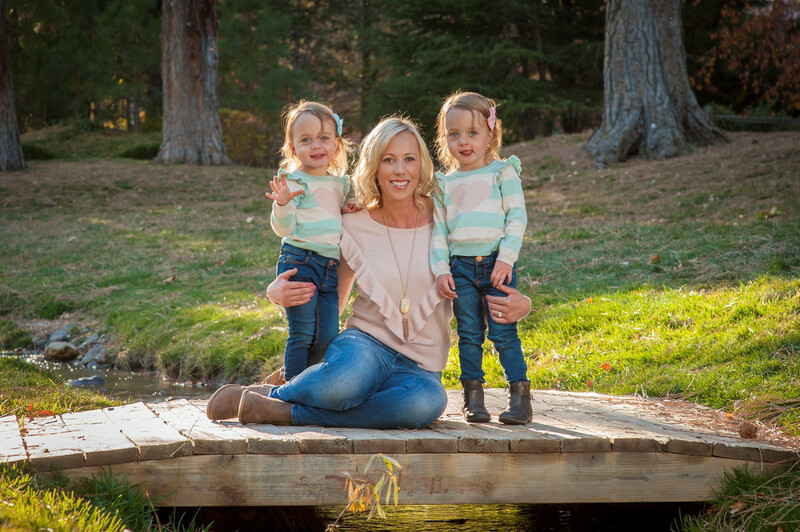 Little unknown: Avery's middle name is Madison. I have always loved that name, but the year she was born, the Giants won the World Series with Madison Bumgartner. It was fate. 9. Tulips or Daffodils? Tulips. 10. Favorite Outdoor Spring Activity? Going on walks, gardening and Spring snowboarding. 11. Flowers in the Ground or in Pots? Both. We have flower beds, planter boxes and pots. 12. Favorite Bird? Ummm, I guess I never really thought of this, but I will go with hummingbird. 13. Car Wash or Wash Vehicles at Home? Car Wash. I used to wash my car at home, but now I don't have the supplies and the amount of water that I waste, oiy! 14. When Do You pull out Your sandals? Usually in April unless we have a nice 70 degree weather before that. 60 degree weather sounds so good right about now. we are looking at a high of 38, yuck! I know you got some cute sandals girl, can't wait to see them in your pictures!! Come on Spring! I have seen that it hasn't been that warm across the US. Boo to that. Oh I got a few pairs this year. I will definitely be showing them off. 60 degree weather is the perfect temp in my opinion!! We don't get too many of those days around here though :( I really need to spring clean this year, mainly the kids clothes! I wish it was spring here! It snowed yesterday! For me, the 60's is the ideal weather temp but sadly we don't get much of it. Winter just doesn't seem to want to end here, it's currently snowing! Haha we picked the same colors. I love the weather the first few weeks of spring before it gets too hot and muggy here. And I totally wore my sandals today for the first time! Reminds me that I need to get a pedicure, eek. Happy Spring!!! That is too funny. Great minds think alike. It definitely gets really muggy here. We have little to no humidity, so I really love Spring and Summer. I wore my sandals all weekend and loved it. Happy Spring! I wish I had 60 degree weather! It snowing like crazy here in Mass. Have a good week. Sandal weather is the best! I love that story about Avery's middle name. Have a great day! LOL'ing at the mowing comment! Men. ;) Can't wait to officially take out my sandals! I think I'll link up today, too! I have major spring fever (even though it's technically spring... ha). There is something oddly refreshing about spring cleaning! Since we are in move mode I feel like I have more of a reason to do it. Tulips... YES! They are one of my favorites!